Taking you on a sequential journey of breath and Prana, from foundations of breathing to advanced Pranayama practices. This Pranayama Training Course will take you through a progressive journey of exploration, theory and practice of this important Limb of Yoga. The Course is designed to lead you sequentially through stages of development for your own personal practice, as well as providing a structured programme for teaching the techniques. It includes Classical Pranayamas as set out in the Hatha Yoga Pradipika, plus some contemporary practices. The 6 day course is spread out over 8 months, with a 6 week gap between Tutor Days to give you time to learn, develop and master each Pranayama technique. The Tutor Days are a mix of theory, practice and discussion, while your home practice is a mix of practical daily Pranayama and written assessments. For this Training Course, I have also developed an Online Learning Portal – a password protected web page with downloads, videos, MP3s and additional resources for each session. There will also be a Forum to ask questions and receive additional guidance from myself and your fellow course participants. The aim of this training is to bring the practice of Pranayama to life, to give you a deep understanding of why we should include it as part of our Yoga journey, and how to work confidently and safely with the techniques. At the core of this training is an understanding of the nature of Prana – what it is, how it feels and why the practice of Pranayama is as much about Prana as it is about the breath. On completion of the training, you will be able to undertake traditional and contemporary Pranayama in your own practice, and to integrate them into your Yoga Classes and Workshops. I have a deep passion for the practices of the Inner Limbs of Yoga : Pranayama, Pratyahara and Meditation. And I hope to inspire this passion in you too. Julie is a Senior YAP and BWY Tutor with over 22 years of teaching experience. 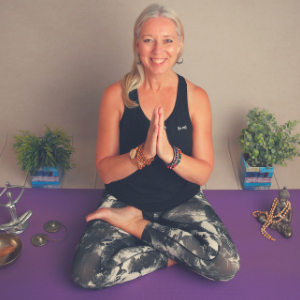 She undertook the 12 month long BWY Pranayama Module with Philip Xerri in 2004, and has continued with a regular personal pranayama practice, plus consistently integrating the techniques into her regular classes and workshops. She has also been teaching the CPD Day ‘Bringing Pranayama to Life‘ for the past 3 years. In May this year she will be undertaking a 10 day Prana Vidya training course to further her understanding and experience of this vital energy. This Training Course is open to fully qualified Yoga Teachers with over 2 years of teaching experience. It is a very practical course, and you will be expected to complete a daily 30 minute pranayama practice, to ensure the safe and effective sequential progression through the techniques. Attend 80% of the training days (5 out of 6 days). In exceptional circumstances, if a training day is missed, you may be able to attend the day on a future course if space is available. Course Assessments consist of: 6 x essays, 4 x short written pieces, 1 x micro-teaching practice, 5 x lesson/workshop plans. 6 full days of Yoga Alliance Professionals Senior Yoga Tutor and Accredited Trainer Contact from 10.00am to 5.00pm with an hour for lunch. Online Learning Portal with additional resources and further tutor contact via the Group Forum. Full Training Notes provided in comprehensive PDF format. Assessment and feedback of all work submitted. Certificate upon successful completion of the training. CLICK HERE to read the full Terms & Conditions, Cancellation & Refund Policy, Booking Procedure and Code of Conduct. Please read these Ts & Cs before completing your application. It is not recommended to undertake a comprehensive pranayama practice if you are a regular smoker. Deep breathing pulls the toxins from the the cigarette deeper into the lungs, and can open up the lung tissues to more damage. I am planning on running this course in Derbyshire and Birmingham at a future time. Let me know if you would like to be contacted when the dates are confirmed. Also please let me know if you would like me to bring this course to your area.